This prayer of St. Padre Pio after Communion is a stirring tribute both to our Lord and to this great saint who bore the stigmata, the wounds of Christ from His Passion. 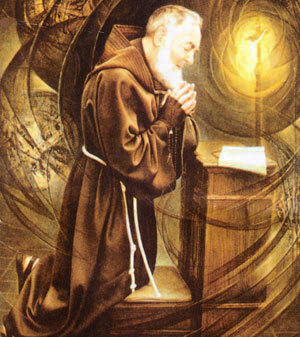 It has been said that St. Pio’s entire priestly life was dedicated to the task of winning souls for God. When you consider that, the first line of this prayer seems to be the ultimate example of humility. Would that any of us might abandon Jesus that “easily”! Stay with me, Lord, for it is necessary to have You present so that I do not forget You. You know how easily I abandon You. Stay with me Lord, because I am weak, and I need Your strength, so that I may not fall so often. Stay with me Lord, for You are my life, and without You, I am without fervor. Stay with me Lord, for You are my light, and without you, I am in darkness. Stay with me Lord, to show me Your will. Stay with me Lord, so that I hear Your voice and follow You. Stay with me Lord, for I desire to love you very much, and always be in Your Company. Stay with me Lord, if You wish me to be faithful to You. Stay with me Lord, for as poor as my soul is, I want it to be a place of consolation for You, a nest of Love. 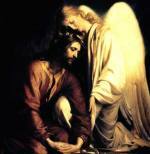 Stay with me, Jesus, for it is getting late, and the day is coming to a close, and life passes, death, judgment, eternity approach. It is necessary to renew my strength, so that I will not stop along the way and for that, I need You. It is getting late and death approaches. I fear the darkness, the temptations, the dryness, the cross, the sorrows. O how I need You, my Jesus, in this night of exile. Stay with me tonight, Jesus, in life with all its dangers, I need You. Let me recognize You as Your disciples did at the breaking of bread, so that the Eucharistic Communion be the light which disperses the darkness, the force which sustains me, the unique joy of my heart. Stay with me Lord, because at the hour of my death, I want to remain united to you, if not by Communion, at least by grace and love. Stay with me Jesus, I do not ask for divine consolation because I do not merit it, but the gift of Your presence, oh yes, I ask this of You. Stay with me Lord, for it is You alone I look for, Your Love, Your Grace, Your Will, Your Heart, Your Spirit, because I love You and ask no other reward but to love You more and more. With a firm love, I will love You with all my heart while on earth and continue to love You perfectly during all eternity. Amen. St. Pio, more commonly known as Padre Pio, or St. Padre Pio, was born Francesco Forgione in the Italian town of Pietrelcina in 1887. He came from a devout Catholic family and felt drawn to the religious life in childhood. At the age of 15 he became a Capuchin novice (as a Franciscan Brother), taking the name Pio in honor of Saint Pius V, the patron saint of Pietrelcina. In 1910, Fra Pio was ordained a priest. On September 20, 1918, he received the stigmata. 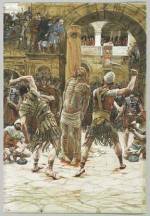 He would experience bleeding wounds from his hands, feet, and side, like those of Christ, until his death in 1968. Padre Pio suffered from other physical ailments as well. 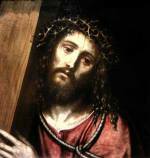 Yet he accepted these crosses willingly, offering his sufferings to God as expiation for sins and for the conversion of souls. The stigmata brought him much fame and yet also some notoriety at first from some church officials who thought that his wounds might be self-inflicted. Still, God gave Padre Pio supernatural gifts as well as the stigmata, which aided the priest in doing His will. These included the gifts of bilocation (the ability to be in two locations at once) and the ability to read the hearts and souls of the many people who flocked to him for Confession over the years. Padre Pio could even predict some people’s futures. Padre Pio was also instrumental in the founding of a hospital called the Home for the Relief of Suffering in 1956. He was so beloved that over 100,000 people attended his funeral. Three times that many attended his canonization ceremony in June, 2002. St. Padre Pio worked tirelessly at the monastery at San Giovanni Rotondo for most of his life, getting by on only a couple of hours of sleep a night while spending many 19-hour days at Mass, hearing confessions, and managing his voluminous correspondence that came from all over the world, all to help bring people closer to God! We see in this prayer how much strength Padre Pio must have drawn from our Lord through trying times throughout his priesthood. Although he had a warm personality and a good sense of humor, he was no stranger to suffering. Besides having the stigmata, he suffered from the aforementioned false accusations about his character from the Vatican in the 1920’s, for example. In 1931, he was forbidden to hear confessions or to say Mass publically, although these restrictions were lifted within a few years, fortunately. St. Padre Pio showed his deep love of Christ in the Eucharist in the way in which he celebrated the Holy Sacrifice of the Mass. Although sometimes he could take several hours, his Masses were always well attended and were quite moving. Note how in St. Pio’s prayer after Communion he wishes Communion to be “the light which disperses the darkness, the force which sustains me, the unique joy of my heart.” May this prayer, like his life, inspire that same deep love and longing for our Lord in each of us!